Home > Eye Wear > Designer Glasses: Are They Worth It? This is a difficult question to answer as it depends so much on your age and your point of view. Your answer will also reflect how much you think is reasonable to spend on your glasses. Some designer frames may be only for the rich and famous but, if you are after a designer look, high street opticians can offer designer frames at a price tag that most people would certainly consider. If you are in your 40s or early 50s and have worn glasses for most of your life, you will remember the horrors of glasses for children in the 1970s and 1980s. It was possible to get free glasses on the National Health Service scheme but these were truly horrible. They had either pink or blue plastic frames, or were the Victorian style of thin wire rims that have since become fashionable at certain times. Back then however, they were certainly not a fashion accessory. Wearing glasses was bad enough, and most children had to have these free glasses as they required changing every year or so. The glasses you could buy were not that much better and there was not much choice for children, but they were enormously expensive. A pair could be as much as £100 – almost the same price as one of the more reasonable designer pairs today. At that time, few parents could afford that kind of expenditure every year. Over the last 5 decades, styles in glasses have changed quite a lot. The small, wire-framed glasses that were hated by many school children became super trendy when John Lennon wore them in the late 1970s. During the 1980s, glasses got bigger and bigger and styles that nearly covered half your face were the height of fashion. At the opticians, however, although there was more choice, many styles were very ordinary, with dull and muted colours, or plain metal frames. Over the last 20 years, the fashion for glasses has been to downsize. 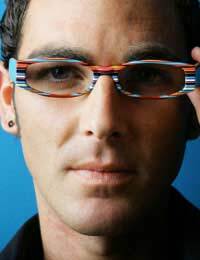 Smaller glasses are still now considered very fashionable, with rectangular shapes being very popular. The materials used to make glasses have also changed beyond all recognition. Technology has produced different types of plastics that can be made brightly coloured, dark, light or even to include metallic effects. In the last decade, when designer clothing, shoes and jewellery have really become popular, the demand for the designer touch has extended to spectacles. Every high street optician is now bursting with designer frames and having an annual eye test and then choosing a new pair of glasses is a much more exciting experience. Well known designers such as Georgio Armani have produced ranges of spectacles and the range of designs that are available is staggering. Are Designer Frames Worth It? On balance, most people would probably argue that the answer is yes. The sheer choice of types of frame that the designer revolution has created means that everyone can choose frames to suit their face shape and their style. There are very expensive designer frames, as there are very expensive designer rings, shoes and jeans. But you are able to choose the budget you want and work within that. High street opticians offer ranges of designer frames that cost around £100 - £150 and usually offer these as part of a package deal, with your lenses included for no extra cost. For something that you wear every day, and that are such an important part of your appearance, designer glasses are probably worth every penny.